My recent trip to India was amazing. As you’ve seen in the images that I posted last week, they help take the blog in a new direction. That being said, I think some of the images have confused a portion of the audience as to why I feel they fit into the context of this blog. 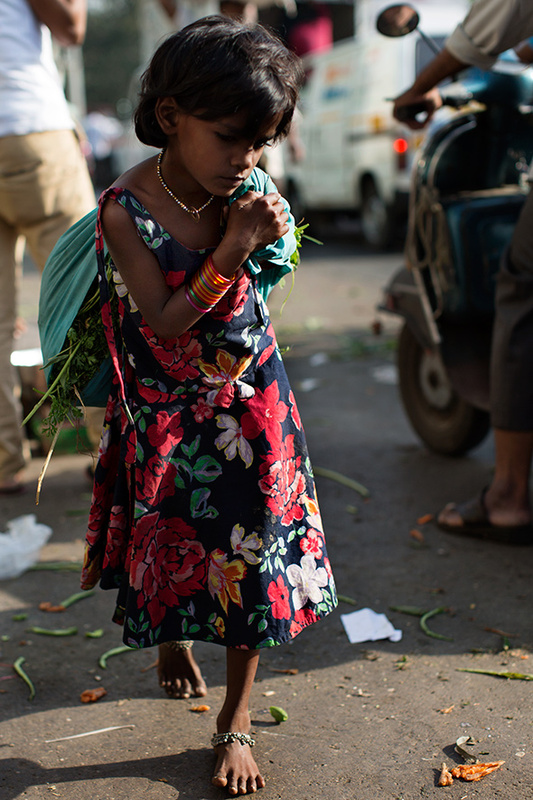 The image of this young girl in the flower market is not a fashion photograph. It’s not about how cute her dress is or is not. And, unfortunately, this is not your typical happy image of a carefree child. None of us know the exact truth of this young girl’s situation, but, what I see in an image like this, is the spirit of a young girl with dreams like any young girl would posses, anywhere around the world. I see her youthful spirit expressed in the joyful colors of her dress and bracelets, but I also see the contrast of having to balance the reality of her daily life. The burden is represented by the bundle of flowers she carries. The way her face is cast down, you literally feel the weight of that burden on her back. I think it’s a beautifully heartbreaking photograph for anyone, like me, who is a parent. At the same time, however, we absolutely don’t know the truth of the image. For all we know she could be helping her family maintain a prosperous flower stall, much like how my father helped on the farm in North Dakota while he was growing up in the 1930′s. If this image outrages you and makes you want to do something about abolishing child labor, great! Let’s not forget Steve McCurry’s Afghan Girl photograph is also beautifully heartbreaking, and made a huge difference in the plight of Afghan refugees during the Afghan/Soviet conflict of 1984. Great post! How much transmits the pic with this little girl! I think its wonderful that you will continue to take this blog to the next level by posting photos such as these. I for one am more interested in street style photos and that’s what i come here to see, but i will always support the sartorialist. That’s a poignant, insightful commentary. I look forward to all that you see. Good luck! I am curious as to whether you received permission from the child’s parent or guardian to take this photo and publish it. I agree with you Sandy, I wondered the same as I saw the picture. I would also like to say that unfortunately this girl does not have the same dreams that for example American girls posses. I’m sorry Lupe but you can’t know, whether this girl has the same dreams as an american girl has, or not. Why couldn’t she have the same dreams? Why do people assume that just because someone is poor, they can’t dream big? Why – and this is reflected in many of this picture’s comments – do people look at someone who is poor and insist on seeing only sadness and despair? To me the more ethnographic pictures that The Sartorialist has started posting are important and interesting because they state the opposite: beauty and elegance, style and a certain extravagance and quirkiness of taste can be found anywhere. They are neither a privilege of the rich nor of the western world. Paternalism is also a kind of prejudice. shooting in a place like India is just different than shooting in the West. the way children move about is sooo different than modern western norms but actually not that different than maybe New York a hundred years ago. I use Steve McCurry as a benchmark and he has shot kids in this same way for years and many of those photos appear in our most respected magazines. As a parent I use my conscious as my guide and I feel comfortable I acted in an acceptable manner for the situation I/she was in. Thanks Scott for reminding us what should always guide our actions…Conscious!! Scott, even in your first book, your fascination with your subjects life circumstances and interior lives was apparent to those who paid attention. This aspect of your photography has become more and more developed over the years. When others were questioning the “fashion” aspect of your third world photos, I was reveling in the increasing humanity of your aesthetic. This is an ever smaller and smaller world, people, and Scott is trying to acquaint you with it. Watch and learn. When i saw this image, the first thing that caught my eye is the colors of her dress; I looked at her face and saw that she was far away and not unhappily so. There is a certain contentment in her look. Capturing so much of her soul is your genius. I grew up in India and my family was of modest means. I was always able to live a normal life…find enjoyment in friends, school, reading and remember it all fondly. It was a struggle to leave all that happiness to come to the US. What we lacked in means, we more that received in stronger friendships and a life full of sharing and learning(we learned far more than any child does here in the US). You have to know that children do not miss what they don’t know or have. They can find happiness in the littlest things..watching a beetle work its way up a tree…etc. That is a core fact with the human condition. I believe that if your viewer has been with you long enough on this Blog, they should have learned/learn the true message you seek to convey. You should not need to defend your position…describe it maybe from time to time…not defend it! How is it that only when you’re photographing in third world countries reflective of “real life” as you call it? All your photographs set in the privileged countries of the North are of affluent subjects and fall into the category of street style photography. However, when in places such as Morocco, Bali, India, etc, you choose to take pictures that “tell a story” — it is a very specific story you’re telling, and it is one of the exoticisation of poverty in the third world. It’s exploitative. Sadly, there is a connexion between the fashion and the more realist photos, and the people in them represented. The garments wore by the former are sometimes made by the latter, in conditions of near slavery. I think the twist you have given to the blog is a very brave and interesting one. Keep in this direction, please. What! from the same parents who sent this child out to work dragging bags of flowers. The world needs to see photographs like these and if it were not for photographers many in the west would be ignorant to what goes on in the east. If she were not “dragging bags of flowers,” she would probably be begging in the street. I understand the reasons stated by the Sartorialist, I just respectfully disagree that they justify this particular photo. Having said that, I overall am really enjoying the photos of India (I am Indian-American and spent much of my childhood in India). It is through your eyes that I am able to see parts of the world that I may never be fortunate to visit. I have always looked at your photos and created a story about the subject. It is easy for people to be critical from the sidelines. If a photo creates a strong feeling for someone then “put your hat into the ring” and do something about it. Thank you for taking me on a visual adventure. The picture was beautiful and I did wonder about the young girl’s situation, but one thing I noticed was how clean and shiny her hair looked. Somehow it made me feel better, like she was cared for. Beautiful photograph Scott. And I love how you’ve described the picture and your thoughts. I love that you mix culture and also photograph fashion. That is why I always visite thesartorialist. You always know how to come with something new. Scott, you mention ‘fashion’ vs ‘cultural’ images, but what is the difference? how and why will you differentiate between the two? are photos taken in ‘rich’ countries ‘fashion’ images? are photos taken in ‘poor’ countries ‘cultural’ images? clearly you have an eye that recognises fashion and culture exist everywhere. each and every one of your photographs is fashion *and* culture – that’s why I find your distinction between the two perplexing. and on the subject of ‘happiness’…. just because people are photographed in ‘rich’ Milan, NYC, Paris, etc, does that mean they are ‘happy’? of course not. likewise, are those photographed in ‘poor’ India, Morocco, Peru, etc. ‘unhappy’. of course not. by no means do I mean to diminish the seriousness of the fight for daily survival that many face… it’s just that life is far more complicated that rich = happy, poor = sad. to impose such judgements is a reflection of oneself and not the person portrayed in the image. The “”fashion shots” are obviously ones taken around fashion week but they can also be considered cultural because fashion is very cultural. The “cultural shots” are images that show insight into a culture. I also have great cultural images I shot in Pennsylvania or Atlanta. instead of complaining maybe offer a better word? obviously you also haven’t kept up with the shots from India because they show the wonderful complexity of happy, sad, rich and poor you speak of but didn’t take the time to actually look at. Scott, please don’t become discouraged. I find your photos inspiring, beautiful, and sometimes thought provoking. They are both your deeply personal art and, paradoxically, something from which you are detached and for which you cannot take responsibility. Your photo did not cause this endearing little girl’s imagined plight, it simply opened our imaginations to it. Thank you. Yes I love what you’re doing. The glossiness of fashion is fun but there is more to the way we look than just that. I used to work in costume design and styling for film and TV, thinking about the detail of the way a certain person might dress at a certain time/place. Your blog is such a fine study of this in real life. What you capture tells us so much about people. But I also like it because insight about complexities of character and dress such as yours are rare. Like others have said, seeing parts of the world I will probably never go to, through your eyes is great. For me it feels as if a wonderful friend is telling me about all the parts of it they know I’d be fascinated by. So thank you fir that and please keep going! more confusion/misunderstanding…. my comment, like your photos, was not a ‘complaint’ about society or anything else. my questions about the categories you mentioned in your original post were sincere… because I spend a lot of time on your blog & instagram, including following your images from India & everywhere else, and because again, it is clear that you appreciate & are able to capture the super intertwined relationship between fashion & culture. thus my questions – how & why to distinguish fashion/culture, to pry them apart? I would find that an impossible task & I wanted to know how you will make such decisions for your book. I agree with you wholeheartedly that your images from India show happy, sad, rich & poor. so too however do your shots from NYC, Milan, Paris and London, although they don’t seem to get interpreted as ‘sad’ or ‘poor’, presumably because they are shot in ‘rich’ locations. bizarre that. I agree with you wholeheartedly that your images from India show happy, sad, rich & poor. so too however do your shots from NYC, Milan, Paris and London, although they don’t seem to get interpreted as ‘sad’ or ‘poor’, presumably because they are shot in ‘rich’ locations – that was all I was trying to say. Wel said Laura. Totally agree. Yes, I agree Laura… there’s a big difference between offering critical insight and complaining. I wish every little girl and boy in the world had the change to be unburdened and have their dreams come true. Oftentimes we see pictures like this one and don’t even realise the truth behind their eyes. That’s nicely written. Thanks Scott. Congratulations for keeping us awake and aware of the world’s inequalities and injustice. This tiny girl in an Indian slum who is toiling while she should be at school building a better future, reminds us how much work there is still to be done in our world. I can’t see why a photo like that should not fit among fashion photographs, on the contrary I find it quite necessary to express all aspects of life through such a powerful instrument as the lens. Fashion is a wonderful manifestation of aesthetics and refined taste, however it is not the main aspect even in the lives of its insiders. In times of dramatic changes such as ours, it is our obligation to make a contribution towards a brighter future and a better life for everyone on the planet. There is such emotion and mystery to this photograph which is what makes it particularly beautiful. There is such weight on this young girl’s shoulders yet playfulness left in the way she chose to dress. The colorful bangles and dress mixed with the different metal finishes in the jewelry brings the photo and girl to life in a magical way. I can envision her personality and dream of what her life is like. Imagery provoking thoughts. Love! I have enjoyed following this blog for several years–the shots are always interesting, provocative, artistic, sometimes fun and sometimes serious–a wonderful blend of fashion and culture that asks the question: where do we draw the line? We don’t know that answer right now, and that’s what makes the blog more than a fashion blog. I am, however, quite put off by the tone that the Sartorialist has taken in this conversation; it is a shame that social media always seems to stoop to this level. I, frankly, expected more professionalism on this site. I think Scott did an awesome job with the initial write-up under the photo, a good job answering some of the intial critical comments, and then maybe let emotion get the best of him. It happens to all of us…we just don’t have public-facing blogs for the most part :) Scott, keep up the positive tone that teaches and explains. I think your readers are encouraged when your words match your insightful and beautiful photos; no need to be so defensive. Thank=you for writing this, Scott Schulman. I would have thought your words would be understood by regular readers of this blog, but perhaps not… I think we can adopt a motto when seeing an image as loaded and moving as the above: Don’t stay mad or sad, get ACTIVE! i always like your pictures !!!! I think you explained the purpose of your site and your photographs well. As part of your typical audience, I appreciate the content you share here. Sometimes I can’t put into words what I feel, but I respectfully keep in mind that there’s a conversation you’re trying to start here. A picture says 1000 words about the subject, the photographer, and anyone else involved in that moment of time that we, merely as viewers, will never know for sure. I am caught in these emotions when I come across many of your not-really-about-the-fashion photos, and I take my time to contemplate them (saving them to my personal files, I hope you don’t mind, so that I can see them again!). With that said, I’m excited for your Nepal and Bhutan photos and hope you have a wonderful trip. I have worked with Nepalese and Bhutan refugees, who say that their countries are beautiful but still in decades-long turmoil. This pix was taken with care and it shines all the dignity and elegance of this little girl. If this is a sample of a new direction, I’m absolutly in! What strikes me about the image of this girl is her desire, no matter what her socioeconomic circumstance, to adorn herself. Whether it is a bright print dress with flowers, an armful of bangles or a tinkling ankle bracelet all show that no matter what she is doing or how she is living she wishes to be beautiful. This is similar to what I thought when looking at your picture of the old woman in Milan who gets dressed for expresso. I think oppression is when that desire to be beautiful is not seen because of societal expectations or cultural stereotypes. Thank you for your important comment about making assumptions about what truth is or is not. I am VERY thankful that these images have made readers/viewers face and digest difficult issues. By posting these images, you are communicating the uncomfortable truth of reality. This beautiful little girl – and millions of children like her – faces a very different existence than the children I know and see every day. I commend you for taking our eyes and minds off the latest catwalk-to-streetwear trends and ladies and gents du jour outside of fashion shows. I heard that Nan Goldin would give prints of her work to her subjects, that they could in turn sell. How can these subjects be retributed? whenever possible i try to give some money to the subject of a photo if i feel it would help. surprisingly this is also tricky because if you do it the wrong way that subject can be attacked by other kids or adults to get the money you just gave them. I saw this happen more than once even though we were very careful about how we tried to do it. I think this picture is extremely beautiful. THe reason why I believe so is because is just the image of truth, reality. Most times we do not want to see images like this one because we want to believe reality can never be what will hurt us. Or probably we want to keep reality out from our imagination and view. The problem is not the picture, the real problem is that she was there to be shoot instead to be in the school or playing with her friends. That is not her place but seeing this picture we don’t forget that our world is an exception. We have to get that you don’t find this pictures anymore!!!!! She might be helping her parents after school, or on week-ends, as it happens in numerous countries or even in rural France or Europe. But going barefeet in the street is a clue that she might be Dalit or extremely poor. Good on you for choosing to capture humanity in all its variances. Personally, I find these travel shots much more meaningful than the fashion ones. Having said that, I enjoy your talent in portraiture. It inspires. Thank you. I have been following your work from the very start and met you when you gave a talk at Wellesley College two years ago. I have never considered your photos anything other than the documentation of the passing parade on the street. I find it hard to believe that anyone would inference that this photo was anything other than a study in contrast. The other side of the street, as it were. I am happy to know that you saw her and she was not invisible to your eyes and camera. Great photographers have always documented our amazing world using images that touch, delight, entertain and sometimes confront us. I think that your work does this, Scott – congratulations on your talent and for bringing the world to us. I also trust that you are doing the right thing by all of your subjects (wherever they are), mainly based on your considerate and thoughtful writing. A small minority may not agree here, probably because they can only see the world in black and white (no pun intended!). That, of course, is their prerogative. La plupart des personnes qui consultent régulièrement votre blog ne considèrent pas, je crois, celui-ci comme un blog uniquement centré sur la mode vestimentaire. Beaucoup de vos clichés s’attachent à montrer en quoi le vêtement participe de la construction des personnes, de leur identité, de la manière dont elles se mettent en scène, de façon très intentionnelle et repérable pour certaines d’entre elles (les élégants, les mannequins de mode, les coquettes, les modeux…) ou moins repérable au premier coup d’œil pour d’autres (passants dans la rue). Et vous vous intéressez aussi, mais moins souvent, à ceux qui ne font pas de leur vêtement un objet d’attention esthétique et qui ne semblent les porter que pour des raisons pratiques ou de nécessité (travailleurs manuels, pauvres, marginaux…). En fait, vous ne vous intéressez pas qu’au vêtement mais vous recherchez l’être humain derrière celui-ci. Et c’est ce qui fait la qualité de tant de vos clichés. Pour être très franc avec vous, je crois que vos meilleures photographies ne sont pas celles que vous prenez à la sortie des défilés de mode. Permettez-moi de vous dire que vos meilleurs clichés sont ceux saisis au vol dans la rue à partir d’inconnus. Beaucoup atteignent à une véritable beauté, alors que chez les autres, on sent trop souvent un effet de mise en scène, de gens qui sont là pour se montrer. C’est en ce sens que la photographie de la fillette indienne est l’une des plus belles du blog. Ceux qui ne savent pas comprendre le sens de votre regard réaliste, sans recherche d’effet je veux le croire, sans misérabilisme et sans jugement sur les personnes (mais invitant, selon moi, à la méditation), ne comprennent rien à votre quête véritable. Et c’est aussi la raison pour laquelle je me permettrai encore de vous encourager à délaisser les sorties de défilés de mode (qui, malheureusement, aurai-je envie de dire, occupent de plus en plus de place) et à privilégier au contraire la rue. Vous faites sur ce terrain votre meilleur travail, et de loin. I am really enjoying the direction you are going. These images speak to me in a way that images of leggy urban beauties do not. They make a nice balance. Thank you for your beautiful work. Ok – just to add this after I read some of the previous comments. I do get the point that children forced into labour etc is horrific etc. and it’s not brilliant to see kids having to suffer. I spent some years living in India and this girl looks very well cared for in the broader picture of things. We don’t really know if she’s working or helping out her family. Either way, she is wearing what is considered relatively good clothes / jewellery etc. Some kids are literally in a reg. It is not uncommon for people in India to go barefoot either! This photo is beautiful. It shows a different side of life and I think that’s good. I’ve always seen this blog as a medium to view art, that is why I keep following it. I love the photos, the view through the lens is unique and I don’t think there’s a better way to portray things. Thank you for sharing all of these amazing photos for free. Thank you, Scott Schumann, for taking a stand. Best post I’ve ever read! There is no way this little girl is being taken advantage of. Look how happy she is to be photographed and her picture used on the internet. Who in this world doesn’t want and appreciate that kind of exposure. As a female in India born into a lower caste, she exists for others. Well done Sartorialist for taking a u-turn with your blog and now shedding light on the realities of life. You are to be applauded. Toast to the Sartorialist. I think everyone starting his blog has his own reasons. Only he knows what is ghe best element to be put here. I love the photos describing lives here and there over the world. Thanks. This photo tells a great deal about you. I feel that it show you care about those about you. May you keep on sharing your caring. This powerful image has inspired so much conversation. Your vision brings us to the table, Scott. I love this picture! As an Indian girl who now lives in America, I felt like this image brought me back to the turmoil and beauty of my home country. Of course she is poor, but she is like soooo many people there full of life, and hope. We can romanticize poverty, but nor can we diminish every gesture of resilience, and happiness under constant discussions of struggle, and anxiety. She cares enough to wear payal ( anklets) and bangles- there is something about her that says she is not going down sorrowfully. I think thats very chic- that courage, and hope. Thank you, Scott. However, after years of following, I never thought you needed to explain yourself. There have always been shots that show controversy. I remember the silver foil covered boots of the constructor worker that showed much more than the coincidental beauty of practicability. You could make something as ordinary as that a part of another context – this really is what art can do. Or the shot of that horribly thin woman that made me, too, along many commentators, question for a second, if this is what I really want to see, or want any kids to see. It stayed with me in a way that made me think, not dress or be. And then there have been photos of other issues that can be just awful: smokers, for example. Or really old people, or young people. People pushing gender, people who literally wear sums of money that, if you think about it, could help the whole community the little girl in this photo lives in take a trip to NY and shop for a week. But provoking is exactly what you can and should do as a photographer. This is your language and responsibility on the stage you have taken for yourself. So thank you, not for this post, but for doing that. This photograph is magnificent. It speaks volumes, and it elicits a wide range of emotions. I love your work Scott! If I could only have one site, it would be The Sartorialist. I totally agree, just wanted to mention that Bali isn’t a country haha. This was a sensitive response to a vast misunderstanding and misperception of your intent. I love that this photo – and others that are also apparently poignant and always thought-prokoing, have been included here on this blog. It’s always important to see all sides of life, so that we may either accepting of it, or try to change it for the better. And for you – as a photographer who travels widely – it’s a gift for you to see these different sides, and it’s a privilege for you to share that gift here; and for us as viewers, it’s a blessing and awakening to behold the gift of those images that we may have never seen before. I’m not that familiar with street photography, but I think this shot is beautiful. When taking a shot like this, do you ask the subject if it’s okay or do you just take it. Just curious. What a wonderful way to share parts of the world with the rest of us unable to travel. Thank you. This is the first time I have ever commented on blog, mostly I am a lurker of imaging. Today, I feel so strongly to speak, I must come out of the shadows in support of our author. Scott, I want to congratulate you to encourage a discussion with your words here. I am not sure where these other people have been, but I frankly do not see this as a new direction. This complexity has had a strong hold and held a strong conversation for quite sometime. For example, you may have a strong interest in fashion but an even more strong interest in beauty. I can recall a conversation of sorts about an image years ago about the beauty of homeless man who was utterly fashionable and utterly gorgeous. http://www.thesartorialist.com/photos/not-giving-up-nyc/ This conversation, this image is what kept my conversation with the blog and you, Scott. You are buying things, you aren’t selling things, you are supporting yourself through advertisement and project, and you are owning your authenticity. Thank you for all of that and this gorgeous conversation, and the courage at the core of it. Thank you for stating also that you clearly need to transform. I don’t look at other fashion blogs and I never saw this one as one. I think those are boring! As ridiculous as it sounds, I love fashion for its ability to hold us together. I don’t think I need to expound here, I really believe most people here would understand what I mean. But what I mean is exactly the complexity that you show us with your lens Scott. Hugs! you’ve written one of the most beautiful text about the meaning of photography that I’ve ever read. Thanks! PS. I’m a photographer and I do a lot of social reportages around the world that focus on stories of resilience, change & beauty. I think that Scott – even if The Sartorialist is a so called “fashion blog” – does exactly the same. His images tell the story of the world. And that beautiful little girl is an important part of that story. I have been a huge admirer of your work, but these pictures and your perspective clearly set you apart. I live in India and have seen the dichotomy between the ‘haves’ and ‘have nots’, but expensive, fancy clothes and accessories don’t always get you style. This has inspired me greatly. Like someone mentioned, don’ t stay mad or sad, get active! Look forward to more! I can’t express how sad this picture makes me. It’s brilliant. And it’s top shelf documentary photography, art, whatever you want to call it. It’s not run of the mill tech institute/fashion photography, which might be confusing for lots of people. Why should anyone be made to feel like they have to apologize for being creative? If you’re going to limit it and box it, may as we’ll not bother looking at it! The wide angle to cultural matter is one reason, why I have been a reader for years. Browsing these images can be compared to reading a short story of Alice Munro – she often fast-forwards the time, everything is different, still the same – and always so very true. Fast-forward from Milan fashion week to street market in India. From high society to the homeless man with bright shoes. I think that it is socially responsible that the documentarist of the aspect of human culture called presenting-ones-personality-via-appearance does not turn the lens to one kind of people, only. You just made my morning with your beautifully written Repost! Thank you for showing us that grace is to be found amidst the chaos and struggle, which is daily life for many people on this planet. The Sartorialist is your place to be true to yourself, so keep up the travelling and the visual journal of life in it’s many colours and forms which is the Sartorialist. You do you, Scott. You do you. i m a little bit tired of some “american ethnocentric” comments about this picture. It’s a powerful and great shot. Why should this girl or others have the same american dreams? It ‘s a pity she has to work but she can work to eat and help family, she has not to prostitute, she is like thousands of children in many countries all around the world, she is alike a lot of american poor children fifty years ago. So please stop with those ” did you ask the permission ton the parents” this is pitifully “new-yorker narrow mind”. Go out of america and taste reality, dear arrogant and lessons givers wasp. This is a great post. Usually one goes , Oh “Slumdog India” and sympathies start flowing. Yes, it could get tragic and heartbreaking. But mostly knowing the poor in India, they are under high stress, but somehow are happier. We all have standardised ideas of what a good life ought to be, and such images may disturb us. A trip to India is just about diverse extreme emotions it evokes, rather than a singular one . The two ends of the spectrum that youve captured when in India, even confuses me as an Indian, but then thats how it is! This picture is a truth, like the more affluent ones, in all likelihood of a happier person, even if burdened. It is striking, and in no way supports or encourages anything we want to shout slogans against. Its great that you have decided to explore cultural subjects, and it may always not be comfortable, but it is purely a great capture and portrayal. Touching and – as always – one step ahead the Zeitgeist. What a stunning shot in it’s own right, a beautiful child, I go to Mumbai a lot and there are so many children living on the streets with absolutely nothing, there is no support for children like her, people work very hard to just get by. I love Mumbai and travel there and North India a lot. It’s an incredible country with such beautiful people. I own more than just a fashion brand – we want to work with India more and give people a chance to learn and work in great conditions. It’s so nice to see that you are now more than just a fashion blog. Thanks Scott Schuman. Your project of creating a “catalog of images that will truly capture a view of the world and its people during this period in time” is a noble and truly interesting one in its simplicity. August Sander would approve. I drink on that Sir! Thank you for sharing all these wonderful photos with us. Life isn’t only about fashion weeks…right? Very eloquent and heartfelt! However, as the direction of the blog is becoming more interesting and diversified – in my opinion, an excellent and thought-provoking improvement – perhaps a change of title might be called for? What do other people think on this one? I’ve always liked The Sartorialist because of the photography, not fashion. In fact, I’ve always wanted to see more landscapes and other kind of pictures from your travels. I wish you will show us more culture and travel! It’s always nice to see different aspects of the world. Not just beautiful smiling people in a fashionable context. Not that I complain about that, I love it too… yes, that is excatly my point: I want to see everything, a little representation of the whole world. Fair enough, it seems to me. It’s a shame you get so defensive/aggressive when people disagree with or don’t share your views though. It has to go both ways, no matter what the purpose of your blog. If we’re to keep an open mind, so should you. I agree here. You tend to adopt a defensive and angry tone which does not serve your subjects very well… Let the images speak for themselves – really. Thank you for bothering to explain. As I see it, this shows respect for your readers. And thank you too for not deleting disagreeing comments as long as they are not disrespectful. Again, it means respect, which I appreciate. However, I never thought this blog or your work as a photographer was strictly about fashion. And even when it comes to the fashion shots, if one bothers to read your captions, when there is one, it’s easy to realise that there is so much more to it than merely a combination of garments and accesories. Your eye sees much further than that, and that’s a reflection of you sensitivity, which, fortunately, you are willing to share with us. Even if from time to time you put your foot in, which, as a human, you’re bound to do now and then anyway. That makes you more, much more appealing to me. That makes THE difference. And I got it from the beginning that the photographs are the trigger for my mind to imagine a story. Whether this story even vaguely ressembles the truth… well, who knows. And who cares. The magic is in the story itself, whether true or not. The magic is in how it moves my soul, how it sends it on a trip of its own. The courage to be honest sets you aside from the rest and, in many cases, above them too. Well said Scott. Your prose is as prodigious as your visual talent. I visited Bombay (as it was then) 40 years ago, and the images stay with me still, as yours will now. I have been a huge admirer of your work, but your perspective clearly sets you apart. I live in India and have seen the dichotomy between the ‘haves’ and ‘have nots’, but expensive, fancy clothes and accessories don’t always get you style. This has inspired me greatly. Like someone mentioned, don’ t stay mad or sad, get active! Look forward to more! Thank you Scott, you’re writing out the exact reasons why yours is the only “street style”-blog I still follow. I am a fashion designer in New York and to be fair, your photographs from India inspire me tons more than pictures of any other editor in any other fashion show. Thank you. The reason I check your blog daily is because the images tell stories. I have a very low boredom threshold thus I get really bored to see those stylish people on line but your are different, you take it to different level. This photograph of the young girl does make me think, does arise questions about her which of course I will not know the truth. She probably come from a poor family but she dresses herself beautifully. I think you are great and I hope you will always to share your visual diary with us. Thank you for the photographs you share with us. PS.. Some people get so upset for what ever the reasons are and trying to force you not to upset them thus it is a powerful photograph if you be able to get them reacted. But this is your blog and you just shoot whatever interest you. You can’t please anyone. your work is all about people and their looks. However if it is about fashion or not. And this is also about the mirror of different cultures. This seems clear and obvious, since the beginning of your work, I think…. Quite frankly, I love that you are posting all of the ethnic photos; fashion shows and haute, pout faced girls are not the only reality in this world. Dear Scott, what a beautiful picture of a beautiful girl, well done! I agree with Matt, you are a photographer and a storyteller. I have followed your magnificent blog for the past 7 years and hope to continue to do so. I only think that the blog became ignited with the title “Untouchables’…and all of us tend to jump on a bandwagon of assumptions,innuendo and then your intention becomes political. We have enough of that on the ‘news’. Thank you for taking the time to explain. God Bless you and keep clicking. C’est le monde ! Le photographe n’invente rien. La petite fille est tellement belle aussi. Cette série sur l’Inde est particulièrement réussie, la photo au Taj Mahal est incroyable. Tant de grâce ! Et les indiens sont très doués, très créatifs. You are not a fashion photographer you are a photographer and an artist, PERIOD. I am sorry that you felt the need to explain yourself. Those of us who get it, get it. I saw this shot as nothing but a beautiful shot, opening us up to the many facets of the world. Anyone thinking that you were trying to exploit anything needs to think again. I hope you, Garance and your family have a great holiday! Thank you for your work, and thank you for maintaining through any doubt you’ve ever had. Thank you for your beautiful work and for the thought and intention behind it. As your body of work grows, so does the breadth of humanity you capture and your own reach as an artist. I love your blog because you tell and share stories around the world … Thanks Scott! I think we’re just trying to make ourselves feel better by framing this photograph in the context of “culture” –to believe that we’re not consuming or making money out of this little girl but we’re simply appreciating and learning about other cultures. Poverty is not part of their culture –it’s caused and perpetuated in large part by external factors, like us who live in the global north. And please tell me you got a permission to take a photograph of her. You wouldn’t post an image of a 6-year old American girl without her parent’s consent, would you? Thank you for writing this, Kay. Steve McCurry was a photojournalist, who portrayed wars. Not a blogger, who discusses the pros and cons of not wearing socks in January. A bit of a modesty does not kill, believe me. And explaining the money giving issue – OMG, are we back to colonial times? You are an amazing photographer, obviously a very perceptive and very human man. I, personally, have loved your India photos as they’ve shown me a side of you (through your photos) that I knew was there (because of the ‘understanding’ you bring to all your photos; it’s obvious, even in your ‘fashion’ photos, that you understand people, understand the world, understand many nuances that a lot of people simply don’t see, that’s why I love your images) but which you hadn’t shown before in any great depth. I feel, looking at your body of work, that the India photos have taken your work to new depths. I was a little uncomfortable, however, by people’s reactions to the photos so am pleased you re-posted this and added your thoughts….people like to pigeonhole, unfortunately: what great artists – great photographers – have the privilege of being able to do is to break through those prejudices, those pigeonholes, to show the world to people in a way that’s a little bit more *as it really is*. Thank you for that, for offering your talent so freely and encouraging so many of us in our own creative efforts. Thank you. Very interesting, I’m glad you shared your point of view, and I’m glad you came to India. I feel you see and photograph people with care and dignity. I appreciate this new turn in your blog. However, I’m convinced that fashion is not some frivoulous thing for smart rich people in front rows… I have not the pretention to define what it is, but more than that for sure. Love your pics Scott. Especially the ones you take in during your trip. I actually prefer the pictures you shoot off fashion week. It’s about life. Not about “nice, good-looking, gorgeous, fashionable”. It’s just about LIFE. And there’s so much about life. You feel life, wind, see colors, light, taste water drops, etc. I’ve not considered you as a fashion photographer but as a cultural photographer yes. You take the instants on the streets : it can be in Paris, NYC, in a desert in Marocco or in a small village in Italia. And each picture has its own story. that’s why i love photographies : its more than image but a whole story. I’m sure that your pictures will help dozen of year later and be treasured as part of our current civilization and current world ! Dear Scott, your cultural images are what I always wait to see on your pages. Please do more in this direction. Your style of taking photos makes people more real in their best way. Thank you for your work and sharing of your thoughts. I am more than happy to see those photos from India on your blog / website. I have been followed your work since 2008 and still I am a huge fan! I am more than happy that You are going this path! I will follow! keep being yourself. keep doing what you’re doing. I’ve been reading you blog since forever and it is exactly because you are not the typical fashion photographer. I always felt that you see the people wearing the clothes which for me is the single most important factor when it comes to garments. One thing I’d like to point out about photography is that it’s fundamental nature of capturing fleeting moments can lead to misinterpretation of the actual context of the moment. This girl could have looked down for a split second, wherein the image was captured, making her expression seem downcast literally, and so we ascribe her as downcast, figuratively. Who knows, a split second later, she could have looked up, caught someone’s eye and smiled. Of course, it’s obvious she’s working, but that doesn’t inherently mean exploitation in many parts of the world. At any rate, I appreciate that this blog captures and published moments like these in the midst of more straight-ahead style shots. The jarring juxtaposition shakes us out of our little bubbles for a moment. I think great art shows us complicated reality, beyond what’s nice or cool or politically correct. It takes bravery to go there, but someone has to. Thank you, Sartorialist. how fascinating it is as photographers, we try to express our individuality and curiosity in how we view the world through what we capture yet it sparks different interpretation from other individuals who use their own preconcieved notions and background to re-contextualise the image. ie. those who view you as a street fashion photographer expect that of your images. those with a chip on poverty issues will dissect the picture to bits. no need to explain to the people who can’t accept. you may lose some fans but you will gain new followers who will appreciate your vision. I must confess, I’m new to the site (no i do not live under the rock.i got in so early on in 2001 that I was jaded by mid 2006..more of a self-imposed rejection of social media trends/explosion in the last half decade) ..when I first saw this image, my first thought was…hey this guy is experiencing what i was experiencing when I first started shooting in India. Awesome evening light, ready subjects -the colours, sights, noises, smells all inundating the senses to the point of slight disorientation…so many so eager to have their photos taken. so many interesting things happening so fast everywhere. Your subject may not stop for you. It takes a while to take in everything and be able to isolate your subjects (i love the nov 21 shot though..nicely composed). I usually offer small snacks and food instead to the children. monetary compensation sets off unhealthy behaviour to future photographers i feel. I am looking forward to your new exploration and works after blending in. A master is the one who create sparks and provokes more thoughts and questions with images. A master is one who is able to sense the change in winds and plots new route and adjusts his sails to cut through the lagging currents. I am Indian, love fashion and regularly follow your blog. But for the first time, I truly GET what you meant to say when I saw this picture. The poverty in India is heartbreaking and yes, there is color/print/fabric- but none of that has anything to do with fashion or looking good. Life there for this girl is about survival, getting your next meal, making it through the day. This photo, to me, ranks just as highly as the Afghan girl’s photo in its beauty and anguish. Thanks. Your blog is fantastic, your photos are amazing, but these recent images of India are really incredible. They’re taking me back to my own trip there this past May, the culture, the sights, the sounds, all of it. You’ve done an amazing job capturing the country in photos. Hello I think the Sartorialist is right to emancipate from fashion and bring back some wonderful and insightful pictures like this from around the world. Go on doing your thing Sartorialist ! Dear Scott, been following your work since the beginning, first comment. Only to say that you have shown real and deep respect to this young girl, a kind of a tribute to her. As you always did in your photographs. You enlarge my vision of style by including the most important : humanity and emotion behind clothes. Thank you so much for this, do not stop. I am a huge fan. Your blog has a huge influence on how I think about fashion. Thank you for making it. It brings me such joy. I enjoy all the posts. Sometimes I wondered why you posted certain stuff and sometimes I saw connections between photos, or some photos were’t glamorous or pleasant, and I thought about the context of your blog and whether the photos were trying to say something beyond fashion or maybe fashion was a secondary aspect of the photo, playing a role in communicating an idea. I thought some of the photos were communicating more than just fashion, but I could not be sure, so thank you for clarifying your process. I think it can be a bit confusing for people lacking imagination, because the majority of the pics are more about fashion, so people are trained to look for fashion, and not look further, also unfortunately for some, they can only spot the fashion, so it may go over their heads. All your photos are art. But art is not universally appreciated and may even be misunderstood. It wouldn’t be art if everyone “got it”. Keep doing what you are doing. Your work is amazing! This is a beautiful photo of a beautiful girl, regardless of her situation in life. Indian people have amazing style! I have lived there and traveled there, and they take great pride in their appearance. I don’t see why this can’t be fashion just because it isn’t an absurdly expensive designer outfit being worn by some society or fashion person in New York or Paris or Milan. You only need to open your eyes to see there is beauty and style in all walks of life. One of my favorite books is (un)Fashion by Tibor & Maira Kalman, an accounting of style around the world that is very colorful! Interesting exchange, number of clicks will be the test, isn’t it? I thought way too much fuss was made over this image. She is a lovely girl, very well dressed, well groomed, and looks very healthy. So what she is carrying something? In all cultures except for our spoiled North American one, children work to help sustain the family. Even here in Canada when I got my first job after school at the ripe age of 14 I was expected to turn in the funds to the family and then allowed some back for pocket money. Here children are spoiled and infantilized and it shows in their behaviour. I have seen huge children as old as six being pushed around in prams! When I return to Ireland in the summer there are all kinds of small children helping out in family shops, or on farms. I was looked after extremely well by an intelligent seven-year-old boy holding down the fort in one family-owned shop. In poorer countries even more is expected of children by necessity. That is reality. I expect this child is happier than many children here, mostly from broken homes, who spend their lives in front of computers. Reading the various comments that have been submitted (some positive, some negative, some profound, some petty), I am reminded of Sartre’s line: “Hell is other people!” Blogging is hard work, and you show up daily with amazing photographs. You have a truly exceptional eye, and I enjoy the complete range of your photography. Thanks for doing what you do and sharing it with the rest of us. It’s really quite a wonderful gift that requires little of us and everything of you! We do not know the background of her life. But I very impressed with this photo. Thank you SCOTT! So touching and so real!!! I can’t help myself. Although I got the point of the photographer, something makes me feel unconfortable seeing this kind of motiv (and yes the child is beautiful and the colors are expressive although the lightful side is overshadowed by the hard work which still seems to be done in confidence ….) in line with mostly before an after motivs of fashion shows (which are mainly stories about young, good looking, educated, creative, urbanised middle class people in western societies). Do we need the poor und vulnarable not to get bored about the standardization in our comfort zone to stay creative? Sei bravo!! And yes, you are different!! That’s why we come here. Very well said. Since 2007. The Sartorialist has been for me a great tool for personal introspection. I wonder how much Scott’s work has changed him, and in which way. If anything, pictures (and art in general) make me think about myself, my own human and social condition and make me question my values, my lifestyle, my everyday choices and activities. How can we change the world? Only by changing ourselves… Each one of us. My personal history impels me to have true compassion for this little girl. I have no idea as to whether she has dreams or not, I can only imagine what her everyday life is. She’s probably unaware of how unfairly hard or doomed (Indian society remains very “stratified”) her young existence already is. Moreover, in many countries, being born, especially born as a girl, puts you in debt towards your own family. I still sometimes seek comfort in reading comments from educated people but truly words are so empty. Words truly make me despair of humanity (a lot more than pictures). je ne prends pas la peine de traduire ce message car le sujet est trop délicat pour que je me contente d’un anglais approximatif pour exprimer ma pensée. Je suis issue de l’immigration et mes amis aussi. Certains de mes amis sont nés dans des pays sous-développés et sont venus faire leurs études ici. Je suis née ici , mais je suis retournée ou allée dans mon pays d’origine , et dans ceux de mes amis. Cette image, je l’ai croisée des dizaines de fois, en contexte. Ta photo ne m’a pas choquée, j’ai eu un peu peur des commentaires, j’ai eu peur que cette photo soit commentée uniquement par rapport à la tenue. J’étais aussi sûre que tu allais être interrogé par des personnes “choquées”. Des enfants au travail, j’en ai vu des tas.Même en France…Quand je croise parfois les petits roms de ma station de métro en habit du dimanche, je me dis “super, aujourd’hui, ils vont s’amuser”, ou “il sont beaux”…Cela ne fait pas de moi un monstre , car je pense aussi aux autres jours. I think that this is a beautiful photograph. We must not assume the worst for her situation as we have no idea of her story. I applaud you for sharing it with us all. I’m a fashion student from South Africa, I’ve been following the Sartorialist for a while now. I find all your posts so inspiring whether its a fashion girl from Milan or a girl in a flower market, for me it’s a study of people and the environments they find themselves in. Love the direction and point of view of your blog! It’s probably perplexing for some that the imagery of the world is more complex than what we glimpse from our “dos and don’ts” shots and reflexive “likes” and such. Scott, you are an optical poet, and some of us are inspired by your ever shifting and curious lens….thanks for stimulating more than our visual cortex…. I don’t understand the perplexity of the people. Culture=Fashion, in the words of Louis Armstrong: if you have to ask what is jazz, you’ll not understand the answer. Amazing how some people write here about children, poverty…and so on…(real hypocrisy)..they seem to me like martians, where do they live?…here in the planet earth?…please wake up! open your eyes! Keep up the good job ! Thanks for this one and your comments. I think your attentiveness is like that of Henri’s in a way. Your eye sees things that perhaps other people don’t see or don’t care to notice. I also think that this is not something one can learn, it just comes from within. I don’t want to write an essay here, so in short, thank you. As an Indian woman who volunteers with young, underprivileged, female victims of abuse the comments on this thread rankle me. Scott is right in that this photo is a poignant if troubling piece of art and deserves a place on this blog. However, please let us not romanticise the life of this girl. She’s not in a character-building part time job and she’s not just like your relative who helped on the farm in the olden days. India is the world’s most dangerous country for women. Millions of foetuses are aborted in the womb every year, simply for the sin of being female. Girls are far less likely than boys to receive adequate nutrition or essential health care so they have a much lower rate of survival even if they manage to make it out of the womb. Millions of little girls are trafficked into sexual slavery and spend their lives enduring horrific abuses. Others are forced into back-breaking manual labour in sweatshops and cotton farms, far more so than their male siblings. India has one of the lowest female literacy rates in the world. Malnutrition is worse than sub-Saharan Africa and gender parity lags behind the Middle East. Basic infrastructure and sanitation are largely absent for the poor who defecate in the open, live in shanty housing and make do with the worlds most miserable living conditions. India has the worlds largest population of sexual slaves, child labourers (mostly female) and child brides. So yes, by all means, admire this girls beauty and style because these innate qualities aren’t limited by one’s circumstances, class or culture. But please don’t trivialise the enormous, horrifying and empirical disadvantages of being a poor, young female in a society that has the worst of both patriarchy and poverty. Don’t pretend that this girl is more privileged than the ‘spoilt brats’ in America or try to exoticise poor young girls as simple and happy. No girl should have to through what is sadly a commonplace reality for the vast majority of young girls in India and glossing over this undeniable reality won’t help anybody. Thank you, Vara. This is the best comment so far – you’ve said it all, and you obviously know what you’re talking about. Thank you so much for this contribution, Vara. This is exactly why Scott’s photograph belongs here, so we can hear voices like yours. We in the fashion industry need to be aware of what you’re saying, I feel. If a child of mine where in the situation you describe, I would hope beyond hope for someone to draw attention to their circumstances. Perhaps this was part is Scott’s motivation for taking this picture. And thank you for all the wonderful, and I’m sure brave, work you do for the girls of India. This is the best thread I have ever read on Scott’s blog. Scott, I believe that “few peoples” can see the largeness of this photo. How big fashion ´s photograph or shooting, or collections from the biggest designers of the world, started with this type of Photo? A lot! Do you remember that iconic collection of the YSL? Told of Safari, from Africa!!! How you said; “South Africa, Morocco, Bali, Peru, China, the UAE, now India”, are extremely cool, rich… As to prefer!!! I love so much this type of veracity of Sartorialist ´s street! Congratulations always, for the wealth of your job and your pics!!!!!!!!!!!! I´m from Brasil!!!! You will be amazed in both, Nepal and Bhutan. I just went there this summer and it’s beyond words. Well, they say when you create controversy, and get people talking, that is what artists are supposed to do. Scott, I ´ve been in India for one month just little before you were there. I,ve been more or less in the same places where you´ve been and have to tell you that while beeing there I thought many, many times how would it be if you ever went there to take pictures. I wondered how would this amazing sense of style be reflected through your eyes. I even talked about it with my partner. India maybe poor, crowded, hectic, hot, sometimes annoying, but they have a sense of color, beauty and style that doesn´t decline even in the poorest circumstances. I admire the elegance of indian women, how they wear their saris and place the veils around their heads or necks so effortless…is amazing. You can´t imagine how happy you made me when I saw that you had been there and you were going to share your impressions with us. It´s been like the world had listened my wishes! Argue whichever way you might. The photo just doesn’t belong here. Scott, that you feel compelled to defend your motives is unthinkable. The Sartorialist is a brilliant documentation of the way we are (Fashion ,for better or for worse, dictated by circumstance not by stylists). Street style as a “Fashion trend” will run its course like any other. Designers only inspired by street style blogs have a very limited vision.People who dress for the lens of the street style blogger are at best caricatures and at worst styleless. I for one (fashion veteran) am more offended by certain “circus” fashionistas relentless appearance in street style blogs than by beautiful pictures of who we really are. of course you’re entitled to take photos of whatever you feel like. i just don’t think that photos such as this one sit well on a STYLE blog next to photos of people in designer label clothing, or a post about a new Band of Outsiders store opening. Yes, totally agree, context is important ! Why don’t you create another separate blog for these pictures ? But the way this little girl is dressed is completely tied to her circumstances and identity… She is human, just like the rest if us but she is responding to her circumstances with astounding grace. The beauty of this picture is in her spirit. It shines out in what she’s wearing, despite (or perhaps because of) her circumstances. She is a TRUE sartorialist and to my mind deserves to be here far more than most. Adornment, the sartorial, is a basic human impulse. If we choose to see style as only a shallow, commercial.endeavour then we are blinkered and ghetto-use the poor. We make them less than human. Truly beautiful work in India. Capturing culture and style or style as culture. A really valuable intersection of beauty, illumination, anthropology, visual delight, and emotion experienced through image. you bought a pair of shoes for her? Great image, superbe explanation (for whom that still needed it). Thanks for bringing us something to stop and thinking, good or bad, for a while. I was very sad and shocked to see this little girl carrying such a big load in the street with no shoes on. It made me think (Yay thought provoking!) about how when I was a little kid and I would play in the streets in the summer with no shoes on, and we didn’t have to worry about stepping on debris. But this little girl has to work when she should be playing and have something soft to put her feet on or in. like your comment, because it’s the first one which makes me aware of what we’re actually doing when we do pics like this . Fine photos. Keep them coming. You see “culture”, I see child labour. I suppose it is just a matter of perspective… and, having lived in India, a better knowledge of the ground realities of the life of the Indian poor as well. Never explain, never complain ! Dear Scott, please keep doing what you do. I am tired of street style blogs and the reason why I am following your work is because you always look for other things than just expensive designer clothes. your pictures tell stories and that is so much more. thank you. Scott records vanity. Why bother speculating on this or that…it’s about what people wear. People wear what they can, but they still have agency. Poverty doesn’t issue a uniform. I applaud Scott’s willingness to acknowledge that he’s merely recording the surface with ambivalence over what lies beneath it. Powerful juxtapositions to your style photos. I appreciate your thoughtful comments about these images. Keep at it. Thank you for your crystal clear explanation regarding an irritating issue! As a half Indian musician myself, I tried and still to reflect through my sound diaries India as a whole: the somber realities but the brightly shining as well. And sometimes you keep something disturbing in mind because it had a butterfly-like touch, too. BTW-, I am looking very forward to your 3rd book: how it’ll be all merged together! It’s really refreshing to see such a thought provoking and culturally relevant picture on a blog. Sometimes fashion blogs appear too much to serve this unreachable westernised ideal of life, when that momentum could be used just as much to explore more relevant issues in the world around us. I’m not for a minute suggesting that fashion blogs aren’t thought provoking, artistic and creative in their own right – but it’s great to see a little bit more of the world as it really is, through the lens of a blog. “what I see in an image like this, is the spirit of a young girl with dreams like any young girl would posses, anywhere around the world”….. Get real Scott, you need to really understand India and real poverty more. Talk to the people and you’ll find out life is not a bowl of cherries. I am touched by your documentary picture.Thanks! Well said, Scott. You are an artist with your lens. That said, art provokes and you will never please everyone. I’m just pleased you carry on with your vision and enlarge my world with your images. Absolutely agree with Scott. I see this as a documentary pic. She may be a poor little girl. But she may be just a girl who has to work as a child and is hoping for a better life. I must say, I love her haircut, adore her dress and accessories. She almost looks like an adult little person. But yes she is thinking and I hope all is well and gets even better for her. Luv the mood of the photo. She is making people think and that is step one. Lots of comments on a very controversial picture! I am not a long-time reader of this blog, although I was aware of it. In fact, I actually started looking at it after the India pictures started. I am Indian, having lived in Mumbai for the last few years of my life. For me, these pictures are in half part a cure for homesickness (I am not in India any longer) and also a different perspective I never saw or thought of and I love that. In Heaven’s name, why is it so important to think the same things all together. I’ve meditated on this picture for a while now. It’s very good. The most striking element, for me personally, is that she does not necessarily look poor. As with a lot of the comments, who knows what her story is. In my eye, suffering is not exactly what comes across. Neither do I get the feeling she’s particularly pleased with her lot in life. What captures my awareness is that such a young Soul is in such deep thought. There’s a great degree of melancholia about her which I’d like to believe does not belong to any one her age. Someone wrote that she looks like an ‘adult little person’. I like that comment. As with anyone who walks this planet, my prayer is that whatever she was feeling or thinking in that period facilitated a shift in a positive direction, regardless of her demographic reality! The photo is archetypal. Who she is is irrelevant to me. What matters is that she conveys the potential for movement and growth. She is Life itself. Therefore, in that frozen moment, she is forever a great teacher. I look at this photo and remember the light available to me in dark places. The bells on her ankles sound like a wake up call to a greater reality that I can step into if I can find the skill to do so. Her necklace is so pretty. Her skin is clean. She is pure child and she will become a stunning woman when she finally ‘grows into that dress’. I see Persephone traversing the labyrinthine caverns of Hades. I believe she will succeed. I could go on and on. She’s a provocative and strong symbol. This is one of my favorite shots of yours. I’d like a print actually. She archetypal and iconic. Thanks! Your images are captivating, political and cultural arguments aside, what you make and share is art. We cannot know what any of the people in your photos could be thinking or what sort of life they truly live, whether in an industrialized western nation or in a poor “third-world country”. It seems fitting to post images of the world as you see it, within the context of the space you are in. I find these photos neither exploitative or appalling. I have travelled to India and have learned that projecting values and norms from my own ethnocentristic point of view is limiting and therefore cheapens if not robs the overall experience. I feel that art is about connection, and travel, and light, and color. It is easy to judge something just by looking at it, and to make up a story about what something is or isn’t. What isn’t easy is grasping a concept that would otherwise be missed or forgotten in a blink of an eye, and to bestow that grace on the world around you. Thank you. Thank you for this important post. Love all your photographs and that you are capturing the beauty of fashion in the world…and showing us issues that need addressing, as well. Thank you. The image is captivating. As are your “fashion” shots – both are tangible yet with such an element of mystery. The young girl reminds me of a Diego Rivera subject…bravo, and keep those eyes open. Whatever anyone says Scott, your work and ethics are amazing, these images are amazing, India is amazing and is worth showing the world the beauty in everything that India is. It’s not about fashion, it’s about The Sartorialist having the ability to reach so many people around the globe, open their eyes, maybe have a say and we all come out a little more educated and inspired. I am totally with Scott here. I think his images from the people and landscapes he encounters in his travels are beautiful and adds a richness to this blog. Some of you are complaining that there is a problem that Scott has high fashion street style images that clearly depict people with financial means on one end, and poor people in developing countries on the other…Please pay attention to what he is doing: All Scotts images are beautiful whether they be the little girl in the flower market or the 22- year old fashionista in Milan. They show the richness and depth of human life from one extreme to another. If you want a mindless fashion blog about the newest Prada bag and the must-have shoes there are plenty of blogs that offer that. This is Scott’s blog, his work, his art, his ideas, and his way to communicate what he finds interesting and enriching in the visual world – I am so thankful that he is sharing it with all of us. Bring it on Scott! no one ones a “mindles fashion blog about the newest Prada” who has a different way of looking at this pic o.k.? Deal with it. I like your personal but objective point of view. Also it’s healthy enough to share with everyone here. Thank you for this message Scott. Each words are right in their place. It is very good that an artist with your talent and your popularity decide to expose a part of his work as a subject for reflection about society, justice, poverty and so much more. A part of your pictures in your blog were already showing us something else than just fashion and beauty and I’m glad that you want to show us more of that. Keep going what you do. I understand that you are going after life from point of view. Joy and sad everything involved. Also the clothes can determine the culture and habbit as well. So in that case i would like to see you in Mongolia first place. A long time follower, I must say the ‘cultural’ photos are your best yet. The satorial lens captures an often neglected dimension that is the complicated beauty of the world. Your photos force the viewer to linger on a single frame in an uneasy attempt to wrestle with the inherent contradictions that technology and globalism bring to bear onto the modern human experience. Bravo Scott. Great post. Well said! I’ve always thought your blog was more than just a fashion one. You take beautiful photographs and they always bring out something in me when I look at them. I look forward to seeing your Nepal and Bhutan series! All the best! Been following your posts since ages ago. I am always a fan! By the way, a minor correction. Bali is not a country, it’s more of a province/state. Indonesia is the country. but the description alongside alot of these pictures comments on something fashion related…. I love seeing photos like this as well as your fashion work. I want to see your artistic vision and it’s more about the context of the time period and your life. Keep it coming. It’s related to fashion in any case I think. Textiles are so rich in India. this website is really good and the viewers are really sharing nice thoughts.